Turbines and generators are both used in the production of electric power, but the turbine converts available energy forms into rotation while the generator converts rotation into electricity. Depending on the type of energy they use, power plants have corresponding types of turbines and use them to power generators. Turbines have many other uses besides powering generators, but all generators produce electricity. In addition to having different purposes and functions, turbines and generators are built completely differently. About the only thing they have in common is that they both spin. Turbines are used to convert different types of energy into rotation while generators convert rotation into electricity. Turbines have many other applications, such as powering ships and airplanes, but all generators produce electricity. Turbine generators are used to generate electricity. The type of turbine used depends on the type of energy used to power the turbine. For example, a jet engine uses jet fuel to power its turbine while a wind turbine uses wind energy. Even when turbines are similar, they may use different fuels. For example, the difference between gas and steam turbines is that a gas turbine burns natural gas while a steam turbine is powered by steam from boilers. In each case, the external source of energy makes the turbine spin. The turbine shaft is connected to the generator shaft, and the turbine makes the generator rotate. Some turbines, such as those used for jet engine generators, spin very fast. In that case, the speed may have to be reduced by a gear box before connecting to the generator. When the generator turns, coils of wire move through a magnetic field, and electric current is produced in the wires. The electric current runs through transmission lines to homes where it powers lights, electric heaters and electric appliances. Turbines are made up of blades that rotate around a central shaft, a little bit like fans. 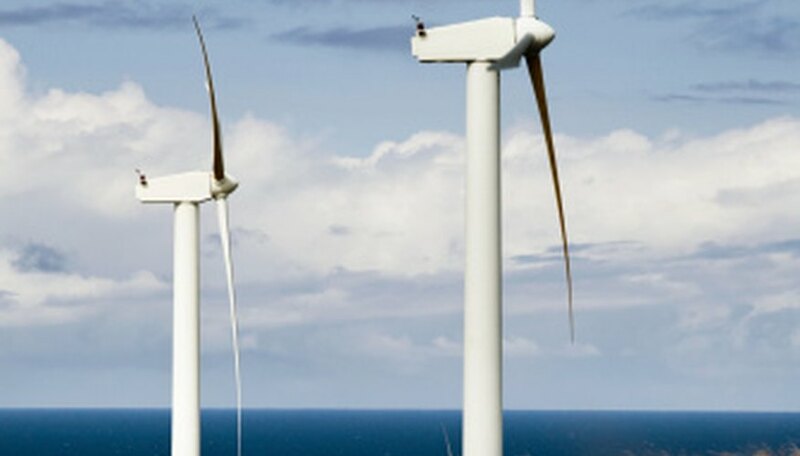 Wind turbines are a good exampe of large turbines that rotate slowly. For water turbines, there are only a few large blades while for gas and steam turbines, there are many layers of small blades that spin rapidly. In every case, a liquid or gas such as water or air flows through the blades to make them spin and power the turbine shaft. Generators also have a central shaft, but magnets wound with wire are mounted on it. The shaft and magnets make up the generator rotor. Around the shaft and the magnets are stationary coils of wire that make up the generator stator. When the shaft rotates, the magnets of the rotor produce magnetic fields that pass over the coils of wire in the stator, generating an electrical current in them. In some generators, the magnets remain fixed, and the coils of wire are mounted on the shaft. In either case, the generators always have magnetic fields passing over coils of wire to produce electric current. Turbines can be used to power generators, but they are also used in many other applications to produce rotating power, mainly for transportation. Jet engines are turbines that run on kerosene and either produce rotating power to turn propellers or speed up hot gases to produce thrust for the jet airplane. Gas turbines burn natural gas to power ships, and steam turbines use the pressure from boilers to produce rotating power for industries. The rotating power from turbines can be used wherever there is a need for driving rotating shafts. The only function of generators is to produce electricity, but they are used in many different ways. In addition to generating power for the electric grid in power stations, they are used on ships, on offshore oil platforms and on airplanes to produce the electricity required for lights and electric control systems. Cars have small generators called alternators to produce electricity for charging the car battery and, emergency generators are used when the main power fails. Because turbines and generators are often used together in areas such as power plants and wind turbines, they seem to be associated and seem to work the same way. In fact, they are two different machines that fulfill different functions and work based on completely different principles. Midwest Rural Energy Council: How Do Wind Turbines Generate Electricity? Markgraf, Bert. "The Difference Between a Turbine & a Generator." Sciencing, https://sciencing.com/difference-between-turbine-generator-7440700.html. 19 November 2018.